(Entrepreneur and designer Ercole Barovier was the son of Benvenuto Barovier. At age 30 he became a partner in his father's company, the Vetreria Artistica Barovier & C. After becoming its artistic director in 1926, he took over its management with his brother Nicol˜. He became sole proprietor in 1936, engineering the fusion between his own glass workshop and the S.A.I.A.R. Ferro-Toso. In 1942, the new company was renamed Barovier & Toso. Ercole maintained artistic direction of the new company until 1972. Over the course of his 50-year activity, he invented numerous decorative techniques which contributed significantly to the renovation of art glass. Already in the Twenties he obtained great success; first with the murrine vessels, then with totally original creations such as the primavera glass collection (1929-30). From the beginning of the Thirties, he dedicated himself entirely to experimenting with new multi-colored effects, in particular he perfected the colorazione a caldo senza fusione technique which he first used in 1935-36 to create the series Crepuscolo, Autunno Gemmato, Marina Gemmata and Laguna Gemmata. Before World War II he preferred soft shapes and rather thick materials, whereas in the post-war period his interest turned specifically to the field of traditional techniques, which he continued to re-interpret through his very last creations with the series a tessere in 1972. In the Fifties, his work distinguished itself both for the vivid quality of its colors as well as for the singularity of the materials which were noted for the roughness of their surfaces like the Barbarici which sometimes were modeled in primitive forms like the Eugenei and Aborigeni. 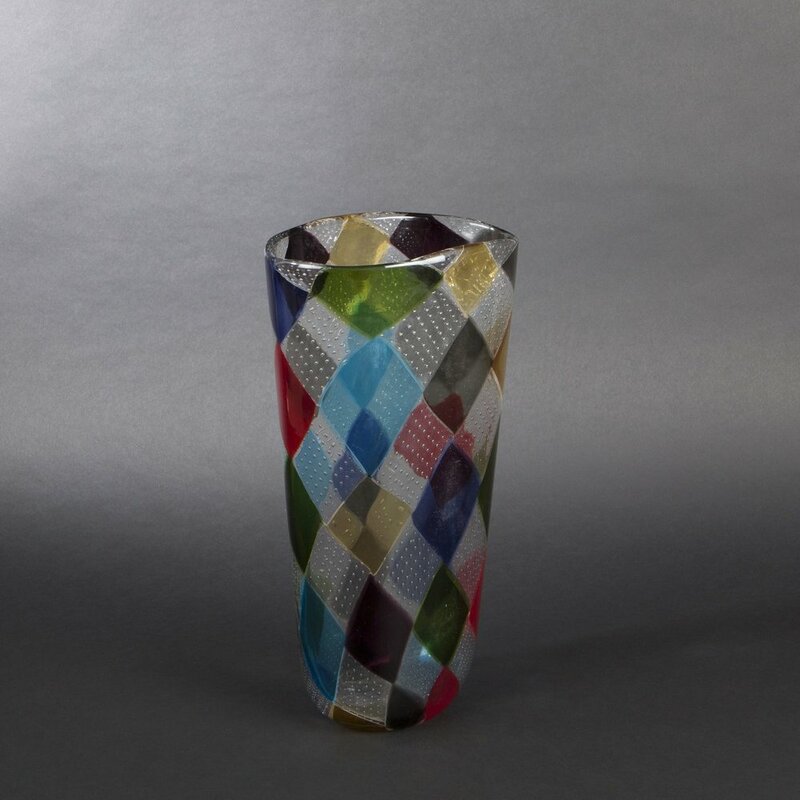 During the Sixties and Seventies, he gave new interpretations of his a tessere glass with the Dorici, Caccia, Rotellati and other series which were characterized by unusual color combinations.